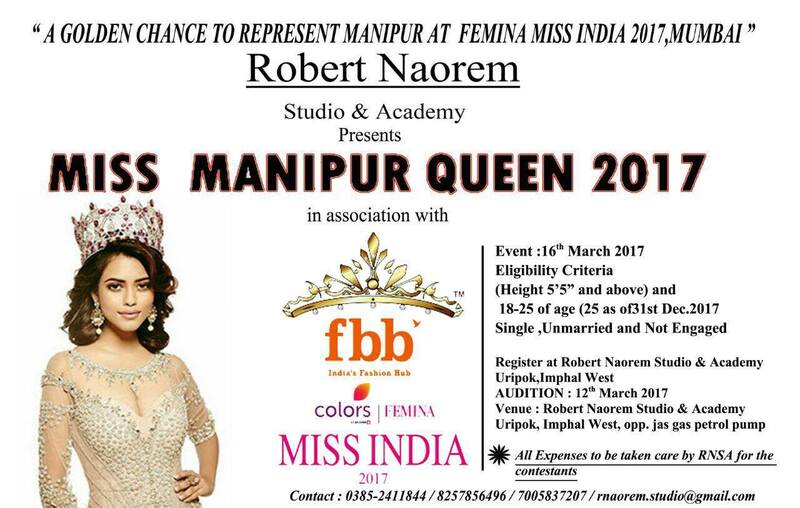 IMPHAL, Mar 10: Robert Naorem, proprietor of Robert Naorem Studio and Academy has said that aspiring models have the chance to shine and bring out their hidden talents if they get selected from the State for participating in the Femina Miss India 2017, one of the biggest beauty pageants in the country, to be held at Mumbai. Speaking to media persons at Robert Naorem Studio and Academy near Uripok overbridge, Robert Naorem said, “Even though there are many talented individuals in Manipur, only few opt for venturing into fashion and modelling. In order to bring out these hidden talents and to carve a path for the aspiring individuals, Miss Manipur Queen 2017, a first of its kind beauty contest in Manipur, would be organised and the winners will get a chance to represent Manipur in the Femina Miss India beauty pageant”. Around 25 models will audition at Robert Naorem Studio and Academy on March 12. The contestants will undergo a three day grooming and training session from March 13 under renowned Indian choreographer and groomer, Achla Sachdev. He said that three contestants would be selected from the Miss Manipur Queen which will be held at Classic Grande Imperial Hall and sent to Guwahati for screening. The contestant who pass the screening will get a chance to participate in the Femina Miss India Finale, 2017, at Mumbai, Robert Naorem said, adding that all the costs will be borne by the institute and donors. Speaking to media persons, Chairperson of Manipur State Commission for Women, Dr Kh Sobita said that such initiatives should be encouraged and supported adding that talents need to be provided with a platform to shine on.